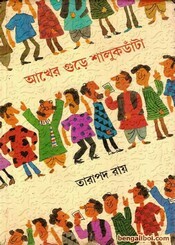 Tarapada Roy was a distinguished poet and humorous composer. He gained a distinct identity in the Bengali poetry world for the mockery mixed Bangla poem. He was a master in child literature. 'Dodo Taitai' is instance of talent of his. He was awarded by the Shiromani Award and Kotha Purushkar (1995). Today I want to share an another book of his writing- 'Akher Gure Shalukdanta', there are three story in this book, these are- Akher Gure Shalukdanta, Hare Ram, Ukijhuki. The ebook has 130 pages, 4mb file size.